Music played a noticeable role in the social life of the poets and noblemen during the Middle Ages. The sound of instruments such as the harp and the crowd and a few other instruments were heard during a feast, especially feasts to celebrate special occasions in the houses of the gentry and in the abbeys. These instruments were used for secular music and possibly accompanied the poetry as does our modern cerdd dant ‘string music’. One instrument that Guto describes in detail is the hunting horn. He composed a poem to request this horn (poem 99) and compares it to other objects and instruments. Church music was considerably different to secular music and had a distinctive role within the walls of churches and abbeys. The monks’ chants and vocal performances would be heard in the abbeys and the pleasant sound of the organ in some churches. The monks’ chants and vocal performances would be heard in the abbeys and the pleasant sound of the organ in some churches. Guto’r Glyn was a regular visitor of the abbeys and would have been very familiar with religious and sacred music. 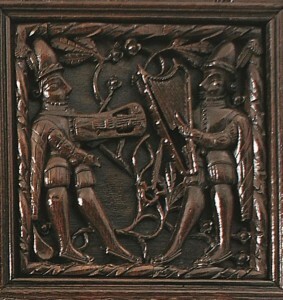 : For a further discussion on music in the work of Guto’r Glyn see S. Harper, 'Musical imagery in the poetry of Guto’r Glyn (fl.c.1435-90)', yn B.J. Lewis, A. Parry Owen a D.F. Evans (goln), ‘Gwalch Cywyddau Gwŷr’: Ysgrifau ar Guto'r Glyn a Chymru'r Bymthegfed Ganrif (Aberystwyth, 2013), 00-00.